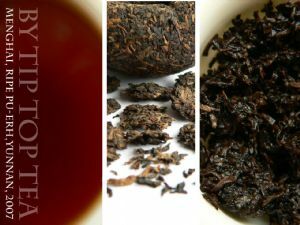 Flavour profile: Fully fermented Shu (Ripe) Pu-erh with a rich, powerful and sweet hit after 7 years of aging, balanced by a complex earthy depth and delicious sour plum notes. Leaf: 100g tuo-cha (tea cake) - pressed blend of Gong-Ting premium grade superfine small leaf into a small bowl shaped cake. Lots of small fuzzy golden tips amongst deep brown-black leaf. Tight compression has now loosened nicely and chunks flake off with a little pressure. Origin: Menghai County, Xishuangbanna, Yunnan, China. Background: Menghai County is located in the west of Xishuangbanna prefecture and home to many of Yunnan's famous tea mountains. 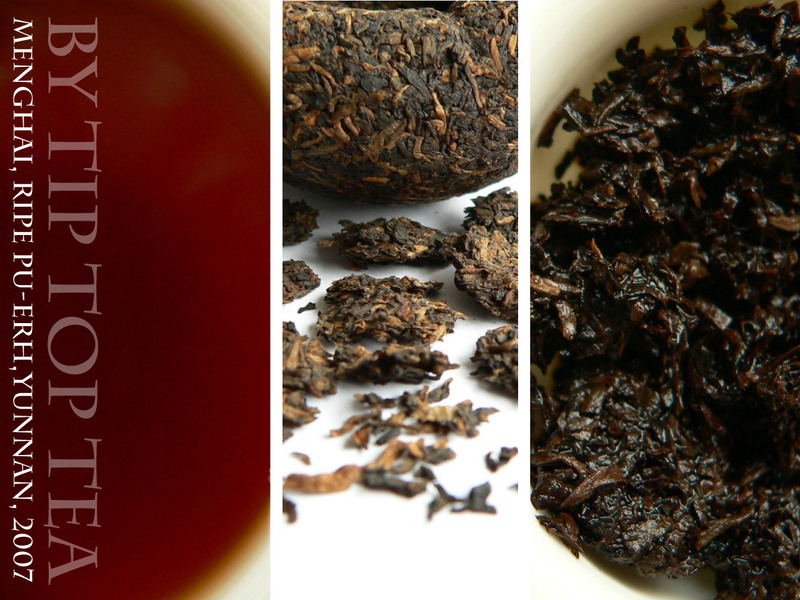 In the world of pu-erh tea the name Menghai is almost synonymous with the Menghai Tea Factory, credited with being one of the first tea factories to produce 'cooked' or ripe Shu pu-erh tea in 1973. Our Menghai tuo-cha offered here is a blend of high quality small leaf 'Gong Ting' grade material from various tea mountains around Menghai, produced by the Xishuangbanna Menghai Yong Ming Tea Factory in 2007. After tasting many single origin and pu-erh blends we felt this was a great example of expertly blended pu-erh; with a rich, complex and long lasting flavour at a sensible price. Brewing guide: Use a blunt knife (letter opener ideal) to softly prise big flakes off the tuo cha, taking care not to crumble the leaves too much. Flake off enough to heap high one teaspoon (4g) per person brewing western style, or 7g (2 heaped tsp) for gong-fu brewing. As this tea is old we should rinse the leaves first to remove dust and impurities that naturally accrue over time. To do this steep the leaves in boiling water for 5 seconds, give them a swirl and discard the water. Repeat for a further 10 seconds and discard. This also serves to wake up these old leaves and warm the pot for use. If steeping western style use 4g per cup of 200ml @ 99C steeped for 3-4mins. Use the same leaves for a second infusion using water 99C infused for 7-8 mins. This tea is also very suited to Gong-fu steeping, use 6-7 grams (4 teaspoons) per 100ml, repeatedly steeped for short periods, eg. 30secs for a first steep (after rinsing as above), then increasing by 10-20secs repeatedly until it tastes washed out. Adjust for personal preference, shorter if too strong, longer if too weak. This is best done in a small brewing vessel, eg. a teapot under 200ml.